We have our trials early and the available Trial papers for purchase come out too late. That means we usually prepare our own. I’m really pleased with this paper and have included marking guides. One thing that’s hard to find are visual texts that aren’t a cliche. Although I did like this one. 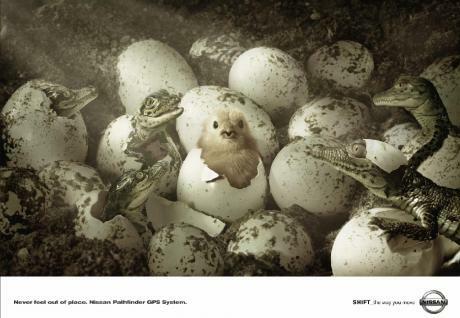 “Write the story of the alligator on the right”,: “Buzz off, I saw him first!” or add a caption for the baby bird! About now kids and teachers are probably looking for practice papers for the Trials (NSW HSC). I have attached a paper I did earlier this year and am working on another as we speak. For what it is worth, I’m sharing my AOS unit on The Joy luck Club. I experimented with a different way to teach the unit this year. Instead of a “close study’ of the text accompanied by exploring the concept through various stimulus and related texts, I very deliberately approached the Area of Study through related concepts. The focus is on two main idea: Belonging and place and belonging and identity. Each phase began with a stimulus and investigation of the concept, then moved into the text, back out to some creative/response writing, back into related texts, back to the main concept. In previous years we always seemed to get bogged down in the set text and students frequently stayed stuck in the text. I wanted students to be more responsible for their own learning and grapple with the text themselves within the framework of the Belonging concept. It was much more enjoyable teaching this way, and did give students many opportunities to connect and reconnect with the set texts and a variety of related texts. Their work in the assessment task was also better. In preparing the unit to share, the simple table format is one I have used for many years. It helps me remember what I was thinking when I designed the original lesson. I think it helps another reader to understand the point of a lesson. Any comments appreciated. These are the last few weeks of school for 2011 HSC students and we have been busy writing practice essays and adding some depth to our thinking about each module and its concepts. Over the years I have worked through many ways of helping students to prepare for this exam, not least with my own kids. How to summarise effectively in English often presents problems for students. Unlike many content based subjects where a list of headings from a textbook and memory cards can help a lot, in English students have to think about the concepts and essay question, draw on everything they know about the topic, select from their knowledge to answer effectively, as well as write an effective essay all under exam conditions. You can tell by the length of that last sentence how overwhelming that can be. This year I experimented with a great piece of advice from Mrs Langford’s Weblog. She suggested students prepare for Module A by thinking about the ‘big questions” in the texts for Module A and organsing notes under these big ideas. She concludes: It is important that you integrate your notes by organising them under key ideas rather than summarising each text separately. Integrated notes lead to writing integrated responses. I really liked the thinking behind this and tried it out in the classroom with the Area of Study. Students thought about the “big ideas” about belonging on their own and then combined in teams to share and write down three “big ideas”. They had to write complete well thought out sentences, since I wanted them to practice writing topic sentences they could use in their essays. We selected 7 of the ideas as a class. We then had a discussion about how an idea was related to a text they had studied in the AOS. With some prompt questions we pushed that thinking to include the techniques the writer was using and evidence from the texts. I then moved students into teams with one “big idea” each and we played ‘Speed Dating”. Each team had a few minutes to add text, techniques, quotes and evidence to the big idea on the sheet and then moved on to the text ‘big idea’. It was great fun requiring some high energy from tired year 12 students, and produced lots of deeper thinking and revision of texts. By the end of the lesson we had a very useful summary that students could refine and add to and that was set up especially to support their essay writing. I’ve since tried it out with year 11 who are also preparing for exams. The response from Year 12 was very positive, with students keen to repeat the exercise with their modules. It is nice to find a workable, high energy way to keep Year 12 working in the midst of what can be a trying time at school!